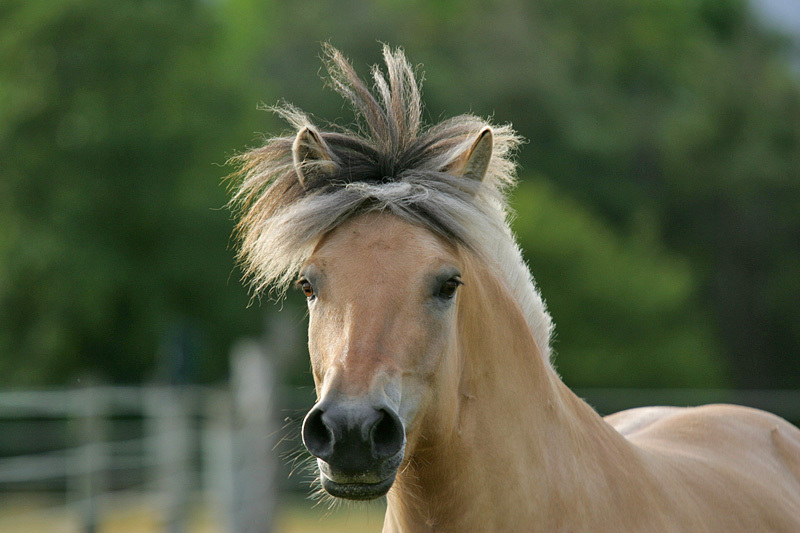 Bluebird Lane Fjords is a Norwegian Fjord Horse breeding and training farm located in Southern Ontario, Canada. Bluebird Lane is home to a carefully developed Fjord breeding program that has produced multiple Fjord champions, including the North American Grand Champion mare Bluebird Lane Kestrel, numerous Fjords successfully competing in open competition, as well as many treasured family friends! Looking for a beautiful, sensible horse you can really have fun with? Welcome! Our Fjords are versatile and willing partners who combine the movement you want and the brains you need with eye-catching beauty that will inspire you. Fjords from Bluebird Lane are sport ponies that ride like horses, possessing the movement, conformation, and temperament to carry you to success in your chosen discipline! Situated on a scenic 50 acres, Bluebird Lane is run by the husband and wife team of life-long horse people, Lori Albrough and Stefan Vorkoetter. 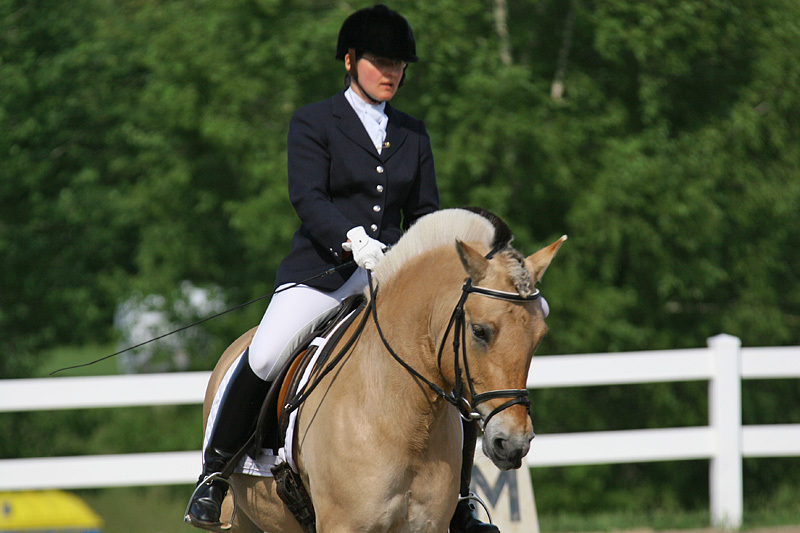 Our specialty is dressage riding, and we breed versatile Fjord horses that have the conformation and movement for success in dressage and sport, with the traditional Fjord temperament that everybody loves. 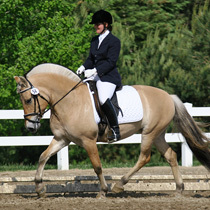 Since 1997, our program has produced many Fjord Horse Champions, including the North-American-wide Grand Champion Mare, and the Grand Champion Gelding and Versatility Champion in the mid-West; numerous Fjord horses successfully competing in open competition including Dressage Canada Bronze and Silver medal award winners; and a great many highly-enjoyed and treasured family fun and performance horses! From the very beginning we have chosen to focus on quality, integrity, and training. 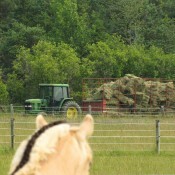 We built our program on three highly-evaluated Fjord mares imported from Holland and a top stallion imported from Norway. Bluebird Lane Fjords are now well-known and sought-after for their movement, beauty, temperament, and the top-notch training that we give them. Fjord horses from Bluebird Lane can be found all over North America, in states and provinces from coast-to-coast-to-coast. Each time we sell a horse, we talk carefully with the prospective buyer to ensure that we understand their goals and are making an ideal horse-owner match. As a result, one of the great joys of our business is the wonderful relationships we have developed with the buyers of our horses who have gone on to become good friends. What this all means for you, whether you are looking for a competition Fjord horse, for breeding stock, or for a great all-rounder, is that we are truly able to help you achieve the results you desire, with a horse that will make your dreams come true! And we are doing dressage with our Fjord Horses! 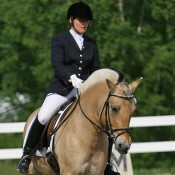 Lori is an active dressage rider, having shown her Fjords up to Third Level with great results. For the past fourteen years, Lori has been developing her own skills in dressage by consistently working with FEI riders who are successful at the top of our sport and embody the correct principles of classical training. 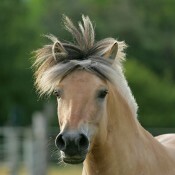 The success of our Fjord horses in the dressage ring in open competition has shown that, yes, Fjords really CAN do Dressage. 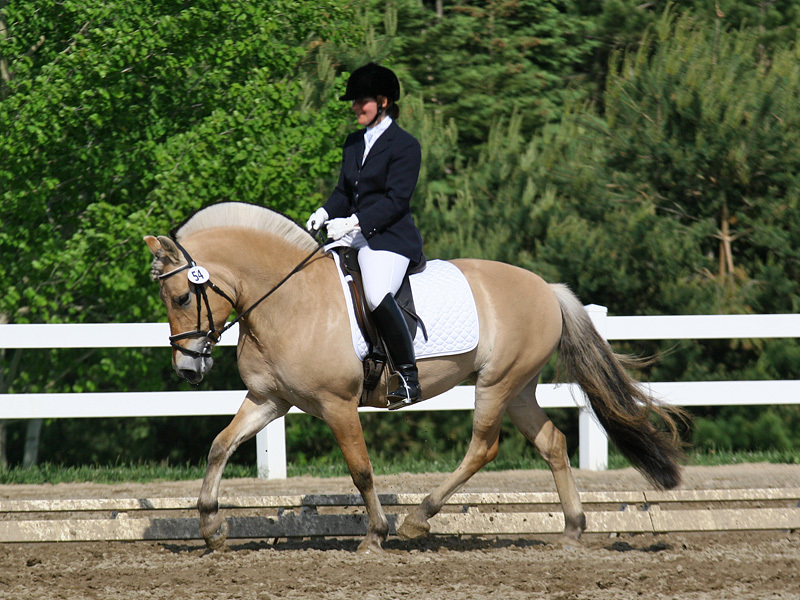 But if you are looking for a dressage partner of your own, you need to know that all Fjords are not the same. Let Bluebird Lane get you off to the right start with a Fjord that is well-suited for sport and has the correct training to make it easy and enjoyable! Although I had bred and ridden warmbloods for a number of years, I felt that as I had become older (and less brave) I might feel safer on a smaller, quieter horse. I ended up buying a handsome and smart young gelding called Einar from Lori, and left him with Lori to start under saddle which she did in a logical, progressive manner. You don’t become great by trying to be great. You become great by wanting to do something, and then doing it so hard that you become great in the process.